Adelaide Botanic Park, Fri 11 Mar. Here we go again. The 2016 WOMADelaide caravan has rolled into town, and I am but one of many thousands of people who will be making what has become an annual four-day pilgrimage to Adelaide’s Botanic Park. The human throng stretches quite a way back from the entry point as I join the queue on Frome Road but, being a WOMAD crowd, progression is orderly and good-natured. I am through the gates and into the other-worldly reality of WOMAD before too long. It’s been another hot and humid day in town and most people have a drink in their hand. There are many options for food and beverages, courtesy of the usual array of colourful stalls and bazaars. 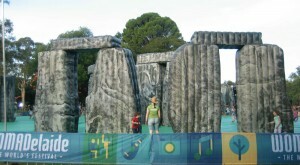 One of the first things I see is Sacrilege, the surprisingly impressive inflatable replica of Stonehenge, and I make a mental note to have a bounce sometime over the weekend. I spy a little bit of belly dancing in the corner of my eye as I pass the Zoo Stage. The Violent Femmes are one of the more popular acts on Friday’s bill, and they put on a great show for the growing crowd on Stage 2. They play all of the songs that people want to hear, and more. Blister In The Sun comes early, while they leave Gone Daddy Gone and Add It Up until the climax. Some folks have been here since the gates opened, and have taken in the Kaurna Welcome and Hazmat Modine but, for many, the Femmes is the first taste of this year’s feast. Either way, I sense that we are off and running in some style. As the sun finally gives way to the dusky light of the evening, the bulk of the WOMADelaide crowd makes its way to the Foundation Stage, in anticipation of witnessing something very special indeed. The legendary Angélique Kidjo has teamed with the Adelaide Symphony Orchestra to present a concert of magical fusion. As I head towards the stage I hear the gentle strains of Summertime; not what I expected, but a beautiful, moody start. For over an hour, Kidjo and the orchestra hold the audience in their thrall. She is in good voice and good spirits; this is most evident when she leads the captivated masses in a delightful call-and-response section. The crowd stretches back for what seems like forever. A crescent moon begins its downward journey, adding a splendid backdrop to the proceedings. Once the last of the orchestral strains passes into the ether, I make my way to the Moreton Bay Stage to catch the Canadian-Celtic chaos of The Jerry Cans. It’s good fun, characterised by the energetic accordion and fiddle. It’s infectious; the temptation to jump around a little and sing along is pretty strong. Time marches on and, rather too soon, the small hours are knocking at the door. While many folks head over to see and hear The Cat Empire on the Foundation Stage, I take in the wonderful blending of Indian classical music and more familiar western sounds presented by the matchless Debashish Bhattacharya and his small ensemble on the Zoo Stage. Bhattacharya was last in Adelaide for the 2014 Guitar Festival, showcasing his incredible talent, and it is a privilege to have him return to these shores. Heading back out into the “real” world, a noisy choir of the Botanic Park bats wishes me a safe journey home. 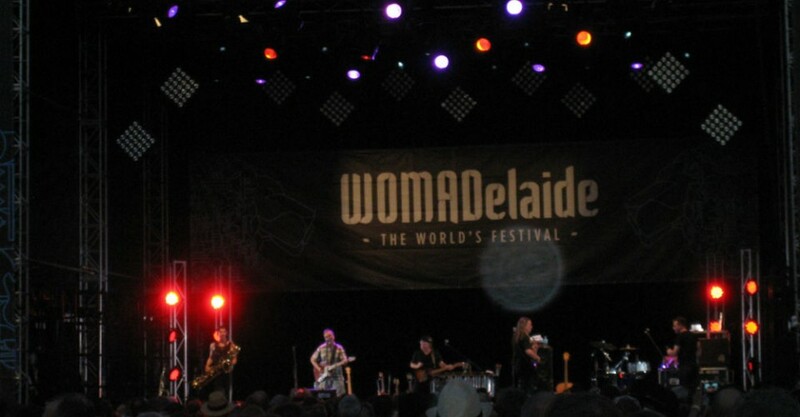 It’s only the first night, and already I am completely infused with the spirit of WOMADelaide. All indications point towards a wonderful weekend. Images courtesy of David Robinson.